Dakota our 50% European well marked mantle, was bred with Mojave our 100% European solid black polish import! 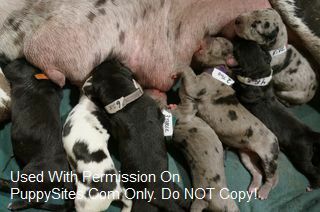 The end result was a gorgeous 75% European litter of 8 black puppies with white markings! 5 beautiful males, 3 stunning females! These puppies will be big! They have the great European blood lines! Their longevity out surpasses the American Dane lifespan. Each gorgeous puppy comes with a full AKC registration, 2 yr health guarantee, 1 yr added if kept on Nu Vet tablets, making the health guarantee a whopping 3 full yrs, micro chipped if your puppy gets lost or stolen, vet checked for the first 8 wks and more.